Successful technologies are those that make teaching and learning easier and more productive. If a digital resource, tool, or app is difficult to find or troublesome to access an unnecessary barrier to learning is created. Access is only one piece of the puzzle and there are even greater challenges institutions and schools face. As educational apps continue to proliferate managing the flow of meaningful data generated by multiple applications is essential for teachers, students, administrators and parents. These analytics have the power to provide valuable insight into student learning to stakeholders from administrators to students, teachers to parents. IMS Global provides a complete set of key standards, code libraries and APIs that enable the seamless mash-up and data interoperability for a truly integrated teaching and learning experience. 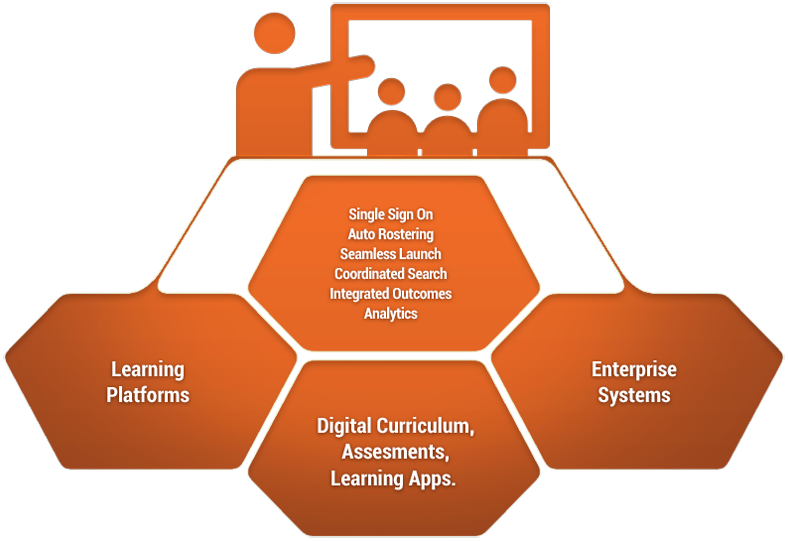 The result for end-users is an evolution to digital curriculum, apps, tools and learning environments that makes the educational experience more productive with greater insight. Can this sort of integration be done today? Yes, but even the best resourced institutions have difficulty creating and maintaining seamless integrations with a small number of applications. The same is true for even well-resourced suppliers. Engaging with IMS Global is the best path for your organization to participate in and help grow a revolutionary open EdTech ecosystem!